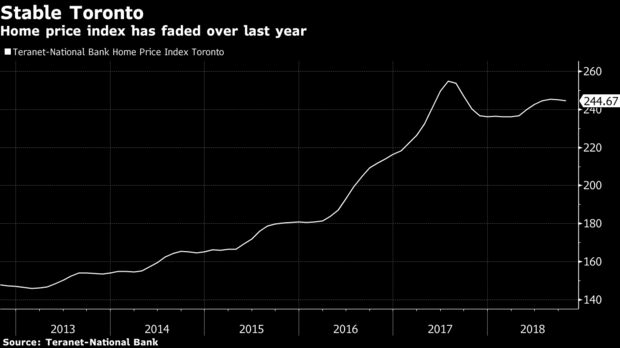 The latest string of data indicates the market is experiencing only a modest adjustment in prices in the face of higher interest rates and tougher regulations brought in to tackle a boom that saw values more than double in Toronto and Vancouver since 2009. It’s a Goldilocks scenario that reduces risk in what had become the economy’s main vulnerability -- an impressive achievement only a year after the country suffered a crisis of investor confidence because of debt and housing worries. Canada’s housing boom appears to have come to an end in the middle of last year, following an eight-year ascent that saw national home prices rise by nearly 80 percent. Since then, they’ve been little changed even as market transactions have fallen sharply.